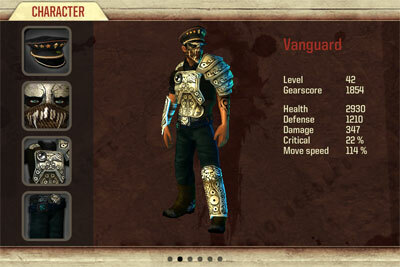 The character screen, or the customization screen, is where one can view and change the armor equipped by the character. Some basic stats about the character including his level (and the corresponding title), gearscore, health, defense, damage, critical chance and move speed are also available. The gearscore (item level) is a composite score based on all the gear a player has (does not take into account the permanent health points). It represents how high level your gear is. It is also dependent on the weapons equipped and only the best weapon counts towards the score. Those are the titles given according to your character's level. To me they are just names that add to the gloominess of the game. Sometimes trailblazer, sometimes vanguard. What's the difference?